When her mother is diagnosed with a rare form of cancer, Karen Babine―a cook, collector of thrifted vintage cast iron, and fiercely devoted daughter, sister, and aunt―can’t help but wonder: feed a fever, starve a cold, but what do we do for cancer? And so she commits herself to preparing her mother anything she will eat, a vegetarian diving headfirst into the unfamiliar world of bone broth and pot roast. In these essays, Babine ponders the intimate connections between food, family, and illness. What draws us toward food metaphors to describe disease? What is the power of language, of naming, in a medical culture where patients are too often made invisible? How do we seek meaning where none is to be found―and can we create it from scratch? And how, Babine asks as she bakes cookies with her small niece and nephew, does a family create its own food culture across generations? 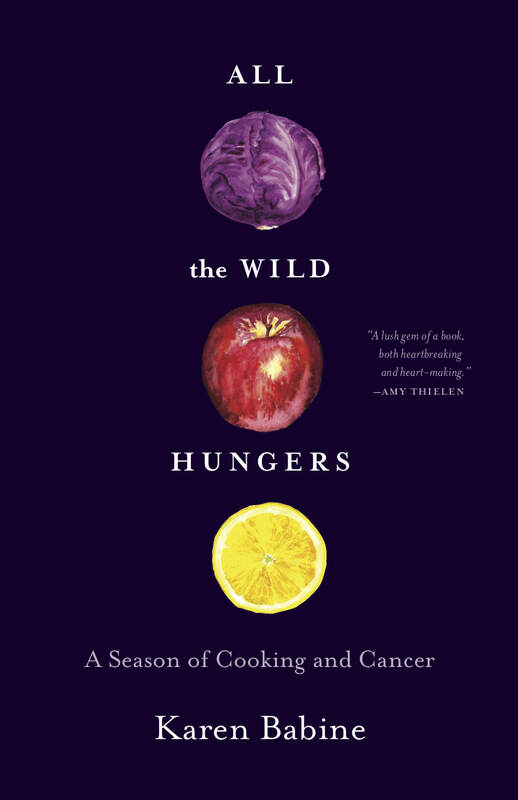 Generous and bittersweet, All the Wild Hungers is an affecting chronicle of one family’s experience of illness and of a writer's culinary attempt to make sense of the inexplicable. Interested in All the Wild Hungers for your reading group? Check out these great resources from Reading Group Choices, including a discussion guide! The structure of All the Wild Hungers is in essay form, and I really enjoyed the short anecdotes. Was there a reason for that type of writing structure? Was there a benefit to essays as opposed to a novel? ​Kao Kalia Yang, the wonderful Hmong memoirist, said something this summer that has resonated with me, something her father said: “The human life is individual. It is not unique.” I’ve been thinking about that a lot in the context of this book. I could have written this as a memoir, but it didn’t start out as a story for me—it started by being so disturbed by the food metaphors of cancer that my mom’s doctors were using. I know my Susan Sontag, I know Illness as Metaphor. But I hadn’t encountered the food metaphors before—and as a cook, that didn’t sit well with me. The nonfiction I like best always starts in those moments of friction. The Growler: What was the original crystal that this book formed around? People find a passion for cooking in many ways. A cancer diagnosis usually isn’t one of them. But for Minneapolis author Karen Babine, a love of food grew out of a cabbage-sized tumor discovered in her mother’s uterus. In her new memoir, All the Wild Hungers: A Season of Cooking and Cancer, Babine takes on the challenge of appeasing her mother's changing tastes during and after surgery, chemotherapy, and hospitalizations. ​What inspires you to write? It’s amazing how I don’t really believe in inspiration anymore, as I used to, the flurry of an idea and writing so fast so I wouldn’t forget. A lot of my work is research based, as even that provides really essential questions for me to explore. These days, I’m much more of the mind of the novelist Will Weaver, who once told me, when I asked him if he kept a writing schedule: “Yes, because it would be a shame if the angel of fiction showed up and I wasn’t there.” I try to keep to a schedule of Morning Pages, three longhand pages before I do anything else in the day, which is sometimes hard to maintain during the semester, but it’s the work of being a writer—and that always feels good, even if I don’t get anything earthshattering from it.